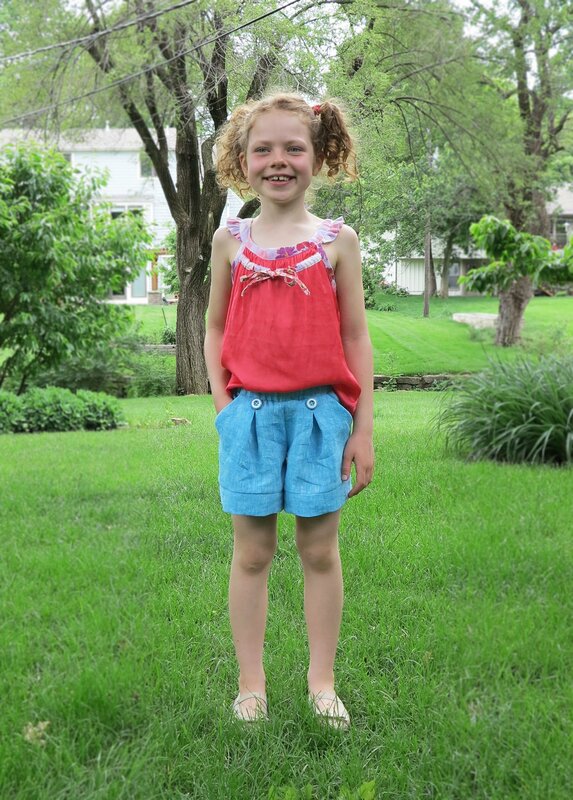 Introducing my newest pattern, the Cartwheel Shorts. 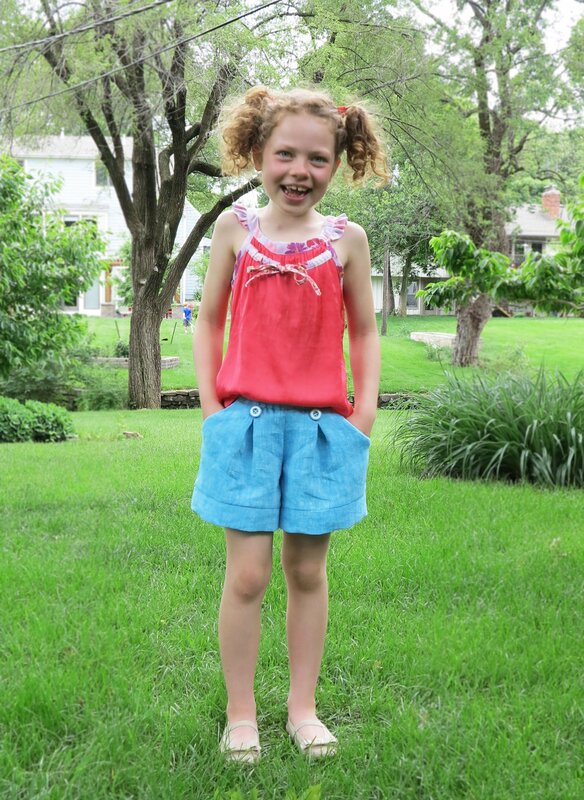 These easy, comfy, cartwheel-compatible shorts are suitable for ages 3-10 (approximately). They work well in a variety of woven fabrics, but my favourite versions have been made up in silk CDC and the linen that you see below. I have ulterior motives in my pattern making. I only make patterns that I love, or that I love seeing on my girls. If I don’t want to see several versions of the same item on my girls every day (or in my own wardrobe), then that pattern isn’t meant to be. I’ll confess that a big motivation behind taking my pattern making to a new level (to include grading) simply comes down to two words: three daughters! I love being able to print out a pattern in three different sizes, and to the exact design that I’d been dreaming of. This shorts pattern is a perfect example. I wanted a dressier looking shorts pattern that would suit my aesthetics, tick their box of approval, and be practical enough for them to play in and wear to school. There were a lot of boxes for me to tick! The version that you see below was specifically requested by Miss Seven. I drew the line at turquoise linen. Purple was also mentioned in the order, but I neither had purple in my stash, nor was I inclined to compromise my perfectly beautiful Tessuti linen with a purple hem and waistband. I have, however, since changed the buttons that you see below to purple ones. I made these shorts up in View B, which is the same (very slightly tweaked) design as Miss Seven’s recent Cartwheel shorts. An example of View A is Miss Three’s recent fairy shorts, which are shorter, with a cuff. 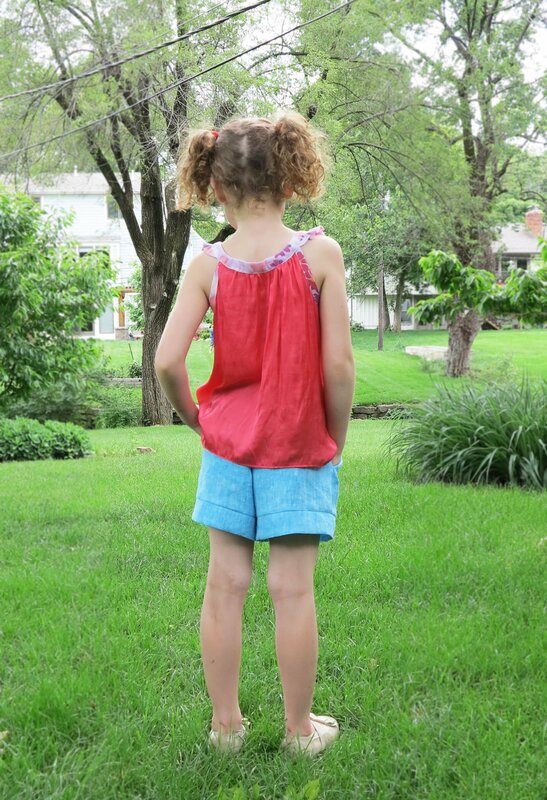 Miss Seven is wearing an Oliver + S Badminton Top with her new linen shorts. 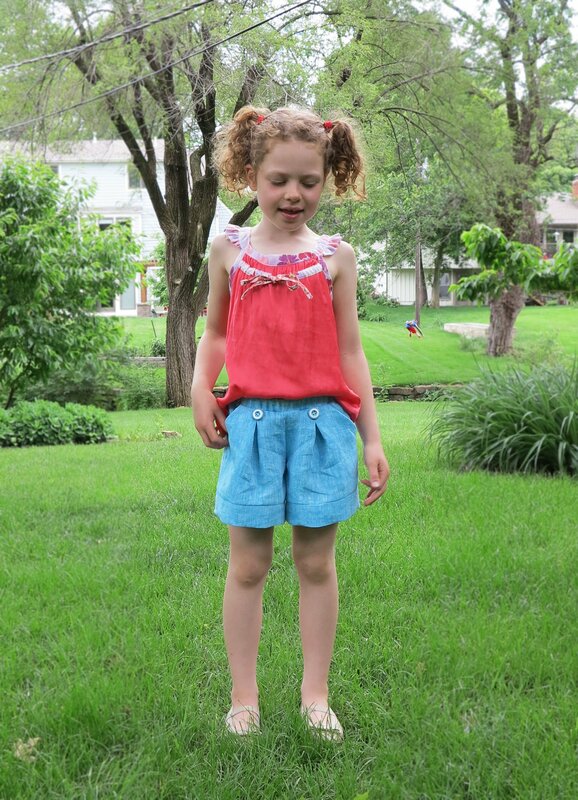 This entry was posted in cotton, fabric, Lily Sage & Co patterns, linen, Oliver + S, pants, patternmaking, patterns, satin, shorts, Tessuti Fabrics, top and tagged box pleat, Cartwheel Shorts, cotton, linen, pockets, polyester, shorts, Tessuti Fabrics, top on June 16, 2015 by Debbie Iles. Omg too cute! Perfect for running and jumping.